Well someone had to be first so it might as well be me. With a bit of luck we can produce a usefull forum regarding surfcasting and the like without massaging ego's. Distance is usefull but not the be all and end all of what goes on in the real world when fishing on the beach. Rigs, rods, head winds and all the fishing paraphernalia we take with us. Last edited by Rod B on Tue Oct 11, 2005 10:24 pm, edited 1 time in total. Extra grip wires or stiffer wires bring about the conundrum of the required line strength to extract them possibly creating more drag . One solution I found was to use braid -I use 20 lb Fireline which gives the drag of .30 mono with an actual strength with good knots of 50lb and thus has no problem extracting the sinker. As a side benefit I was also able to extract a 7 kilo stargazer which would have been impossible with lighter line. Another alternative would be to use heavier wires such as TIG welding wire at around 2mm dia which I have done successfully. For extreme currents a triangular fluke crimped or otherwise fixed to the wires would convert what is currently a reef anchor into a sand anchor. I haven't tried the last idea but it may be worth playing with. I currently use TIG rods for the tail wire and MIG wire for the grip wires. The idea of flattening the ends of the grip wires had occured to me, I contemplated just beating the *@%#& out of the ends of the wires to get more grip. There has to be a minimum of work involved as I take the view that when I cast I am throwing everything on the end of the line away. If I get it back to use again, that's a bonus. The cost of the gear to make end rigs is not that costly per piece, but if one looses a lot of gear then it adds up. Making our own 'toys' is one cost we can control. The aluminium sleeves I use to make endloops in 250lb mono flatten out to around 7mm and would squash onto the ends of the trip wires OK. If the end of the wire was given a gentle flogging first the sleeves wouldn't rotate on them. You could cut the sleeves in half as they are fairly long and are pretty cheap anyway. I buy them from Wellsy's at Caloundra. On second thought, rather than flatten the trip wire ends it would be simpler and more effective to bend the tip back on itself, that way the sleeve definitely couldn't rotate or come off. The link from the main sinker to the plastic sinker needs to be flexible so that the lighter sinker breaks out first. Here are a some breakout sinkers from my tackle box. Breakaway, Gemini and home made. I have no trouble in breaking out under normal conditions but when there is a great deal of sand movement on an outer bank even a 90 gram sinker takes a lot of pressure to move - sometimes pressure has to be applied for as long as five minutes before the sinker will break out. At close range I usually use non anchored sinkers. I fish with mono - 0.35 (15 lb) for tailor/jew but 0.28 (9) for dart bream etc. The beaches we fish are clean. 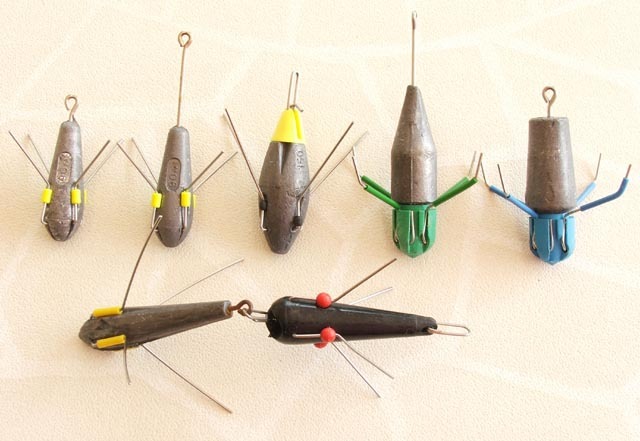 For those interested the sinkers in the pic (L to R) are:- 90 gram short tail Breakaway, 90 gram long tail Breakaway, 150 gram Impact Breakaway,130 gram standard Gemini and a 150 gram flatback Gemini. The horizontal sinkers are a homemade DCA 4 ounce and a plastic Breakaway. All breakout sinkers are adjustable for tension. BTW plastic tubing over the anchor wires, as on the Gemini's, is a good way to get extra grip. Is that what you mean Ian? Last edited by John Softly on Sun Jan 01, 2006 10:39 am, edited 2 times in total. Yes. Sometimes the sidesweep is too ferocious to hold with a standard breakaway, especially when fishing the outer spits around here. I assumed that was the same problem Rod was seeking to overcome. Similar to anchoring a boat - I had to join two anchors with a lenght of chain up on the reef a few weeks ago to hold in the wind and current when I wasn't sure of being able to retrieve a reef anchor. Great patch of Red Emperor and Cobia made it worthwhile. Where in Brissie can one buy moulds for casting weights? I have tried to source moulds and weights in Bris. and Melbourne, but can't find anything better than the "Snapper Lead" moulds. DCA of Cardiff went out of business but there is a mould source in the UK for breakout sinkers. Rod Bolton will no doubt give a detailed reply on where to get them when he reads your reply - he has the up to date UK magazines. You could try Veals or Mainwarings. the gemini leads john has shown as you probally know have a screw on head , the yellow pointed nose cones fixed wire kits are really good for holding in strong tides/currents you can choose how you bend them either at right angles or bring them straight back up from were they exit the nose cone to make them a bit more aerodynamic should you need a bit more distance if you can get the mould then shipping over the heads is not so painfull on the pocket,and there are quite a few different configurations available for you to try,just a thought mate ,hope this helps.